Add the warming flavour of cinnamon to your tea or coffee. This perfect balance of sweetness and spice will make any gloomy day feel cosy. Indulge with this cinnamon flavour by adding to your favourite beverages. A combination of spice flavours and pure cane sugar create this truly authentic cinnamon taste. This will only enhance your recipes and won’t over power them, perfect for anyone who doesn’t want a syrup that is too sweet. Skip the sugar and add something different to your coffee. A splash of this product will feel like an extra special treat every time and is a staple syrup for any kitchen or coffee shop. Purchase your cinnamon syrup with confidence from DaVinci. They are dedicated to only using the highest quality ingredients, creating a gourmet experience every time. The pure cane sugar gives a natural taste which gives this product its luxurious edge. 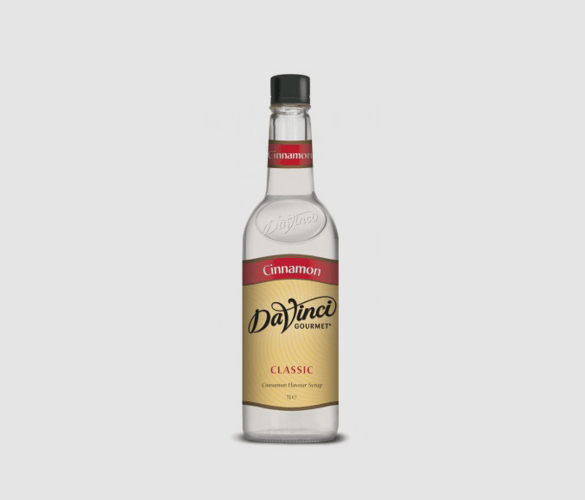 DaVinci specially formulate their syrups to be the best for all customers. When used with dairy products they will resist curdling to give a smooth and silky result. They will also withstand high heats fantastically, making them so easy to use and enjoy. The user-friendly plastic bottle means that you can rely on this product to be safe in the kitchen. We all know how busy coffee shops can be, so this syrup will allow you to avoid dangerous situations. Aside from the taste, the versatility of this product is one of its main benefits. It can be used in so many different recipes, including beverages and food, savoury or sweet. Depending on how you use it will depend on which delicious flavours you bring out of this syrup. Coffee – This product works so well in coffee and will bring a comforting warmth to your mug. Tea – This syrup is not limited to just coffee. There is such a wide variety of teas to try, so add this flavour into some of your favourites to see what works for you. Smoothies – Smoothies can be a delicious blend of fruits and vegetables. Give them an extra boost with a drizzle of cinnamon which won’t over power and just give a subtle hint of sweet warming spices. French Toast – A delicious treat for in the morning. Add this syrup to your toast mixture to add an extra element of indulgence. Brownies – How can you make brownies any better? Cinnamon brownies. They are quite irresistible! Desserts – There are so many desserts which this product compliments perfectly. Try drizzling onto apple pie, ice cream, waffles or pancakes.